We are in the midst of what is possibly the hottest Summer for many years in the UK. The sun is lovely and gardens everywhere are being put to use more than ever before. If you have children then it’s very likely that one thing at the top of their Summer want lists is a trampoline for the garden. When I was a little girl, trampolines in the garden were a rare find and possibly reserved just for the rich people. These days they are a much common site with at least one per street and usually many more. There are many people who don’t have a garden trampoline but wouldn’t mind one, yet are put off as they think trampolines are expensive. Well some may be, but if you shop around then you can find a perfect trampoline for less. This 8ft trampoline for instance costs just £69.99 from B&M bargains. 8ft seems to be the most popular size that people purchase as it is usually a perfect size for the average size garden. This model even comes with the enclosure included so in my opinion this is an absolute bargain. A lot of my friends have trampolines this size and very similar to this one. They seem to last years. 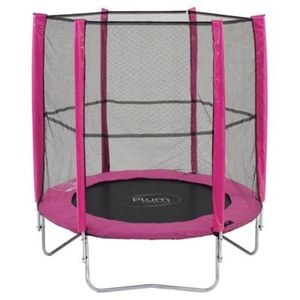 Plum toys sell their smaller 6ft pink trampoline for just £48. Perfect for a little princess and gardens that are quite small. Again the enclosure comes included as standard. This one is so unbelievably cute. It can really only hold one child at a time tho and it’s likely a young child may soon outgrow it and need a bigger one. 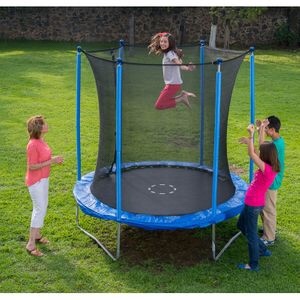 You can pick up a bigger 12ft trampoline for a shocking bargain deal of just £89.99. Again from B&M bargains. Can you imagine this in your garden? I know my kids would love it? Just make sure you have a big enough space as these are huge and take up a lot of room both in ground space and height. Trampolines come in all different shapes, styles and sizes to suit most sizes and styles of garden. It’s important to measure the space you have before purchasing a trampoline and also working out how many people are likely to be using it; as this will also help to determine how big it needs to be. Trampolines can be lots of fun in the summer and certainly don’t need to cost hundreds. In fact many trampolines can now be purchased for well under £100.